There are only 4 days left in our Shadowrun Returns Kickstarter! 4 days!!! The outpouring of support for this project has been phenomenal and we deeply appreciate all of your comments, suggestions, stories and encouragement. Today, we’re incredibly excited to announce that Marshall Parker, who wrote the music for the Super Nintendo game and Sam Powell, who wrote the music for the Sega Genesis game, have agreed to COLLABORATE on the music for Shadowrun Returns. Not only are we excited to have these two talented people working on the project, (we still can’t believe we got them!) we’re impressed by the spirit of cooperation they both expressed. Marshall and Sam really understand what we’re trying to do here and it was a pleasure to hear how happy they would be to work together to bring you the Shadowrun music your generous support deserves. Speaking of what your support deserves, let’s talk about Rewards! 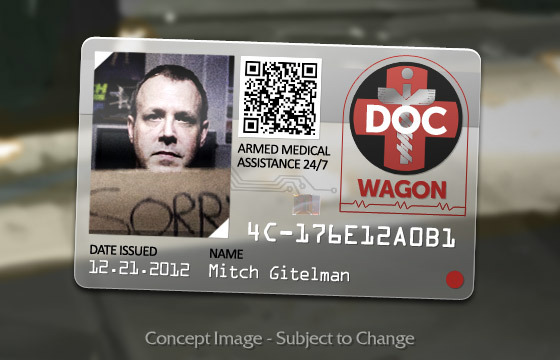 Check out the tasty DocWagon card concept art we added today! We're sweetening the deal for our $30 Reward Level backers! In addition to everything they already get, they’ll also get the IN-GAME DocWagon benefit too! A Reminder: Every backer at the $50 level and above gets their own copy of the SOUNDTRACK! Reading through the comments about the Backer T-shirts, we see lots of fans for all three designs, so we’ve decided NOT to survey backers about which shirt back you want most. INSTEAD, backers at the $60.00 level and above get to choose which shirt they want! But what if you still can’t decide? What if you want ALL 3 SHIRTS??? Then our NEW $175 Reward Level is for you! At $175, you get all previous rewards (excluding the All-Digital Bundle) + all 3 Shadowrun Returns Backer T-Shirts. Did we mention that there are only 4 days left?! That’s 4 days for you to help the Cause by spreading the word. There are still Shadowrun fans out there who don’t know about our Kickstarter. There are still gamers out there who would LOVE Shadowrun if only they knew about it! There are still people out there that don’t know we changed our $7,500 Reward Level to include a game of tabletop Shadowrun in our studio with Jordan and Mike Mulvihill!!! This is a call to action, Chummer. Spread the word. Every dollar YOU bring in goes into making a better, richer, and deeper Shadowrun experience. Share the link to our Kickstarter page via Facebook, Google +, Twitter, secret courier. . . Pinterest, whatever. Share the link to the Shadowrun Primer and bring new people into the fold. Tweet and RT your love. Use #shadowrunreturns so everyone can participate. Use peer pressure (for the right reasons this time) to get your friends involved. What’s in it for you? You’ll make Shadowrun Return. Are we at the point where we can submit photos for our DocWagon cards? Must admit I would love a signed poster of the orignal cover with Saly ghost et all. Being in the IT field, I loved playing a Decker for the depth of control and information with my programs and the detailed environment of the Matrix and cracking a datastore. Please make the Decking part of the game extremely in-depth and engaging and not just a mini-game. Being able to take over security cameras and interacting with security systems of say the Arcology is very appealing. I think a very cool option for backers is to get an original print of the 1st Gen book cover art signed by the team. I still think that the art on the book set the tone of the game and best represents what the game offers. Something like this would look great on my wall next to all of my friend Kevin Long's art. So, at the rate this is going and the generous amounts being given, I recommend seeing if we can get more backing for a multi-player option. I am not expecting anything on the scale of cloud based but the whole hook for me since 89 was the interaction between other people. Without that interaction the game suffers. I work for Microsoft and we pitched a SR MMO to the Gaming Division and during our research we found that multi-player options was one of the most requested feature. Please consider this before capping funding for new options. Just calculated: if every-one raises their pledge by 8 $ we'll have already enough to crack the level for the next reward. I upped mine from 60 to 125. That concept image looks like a transparent platinum card. I can't think it'd be too hard to make the gold one transparent as well. I just hope the cards are ... substantial. Thick like a credit card perhaps. I wonder what the scan image on the front would do though. What will it show when scanned by a smart phone or the like? Seeecrets.... I love it. b) but the stylish S on the 'S' in ShadowRun rather than the 'o'. d) figure out some way to do multiplayer, even if it's just limited *OR* just for player mods ? e) is there any way to do, as we have done in player games, an "all hacker" or "all mage/shaman" team? This allowed us to really go deep into a specific class -- suppose it'd be cool to do all riggers/drones as well...? @Laurent Maire, thank you for pointing out the comments, I hadn't read those, hilarious. ^_^ Please add a 2 SHIRT option @ $125, or $140-$150. I really hope there'll be some classic FM synthesizer sounds in the new soundtrack, a la the Genesis' Yamaha sound chip. We need stretch goals for the last run! I agree, the incentive of the $50 tier has been decreased since those who pledge at $30 will no receive the DocWagon benefit. I think HBS should consider providing 2 DRM free copies at the $50 tier to create a greater incentive for backers to increase their pledge from $30 to $50. I agree with Mbourgon about putting extra money that would go into the cards into the editor instead. Especially if it means we can import art assets such as character portraits - I can only imagine what kind of characters people would create for their shadowruns! @ßöbby So you'll pick the shirt you want them to send, and vote for the second city (that poll is still on as far as we know). @ßöbby You'll give them you choice then, along with your address I expect. @ßöbby There'll be a backers poll sometime after the end of the Kickstarter -- it's built into the system and can't happen ahead of time. where do i go to select the shirt i want? i'm glad it's not put to a vote. I just went back to play the Genesis version again yesterday. Yes the music is pretty cool there. I can still hear the music today. Amazing! I was really excited to hear this. I love what the SNES music did for that game, and I still go back and listen to it (not to mention I still go back to play the game). Haven't played the Genesis version a lot, but from what I've seen the music is pretty cool there, too. This is going to be great, for sure! * I stand up and applaud the addition of 2 musical guru's to the Shadowrun Returns project and yet again the addition of more -stuff- * :P Love all you guys working to realise this! AWESOME! My jaw dropped when I read you got Marshall Parker and Sam Powell to do the music! Hey, that's great news, I mean the soundtrack! "Real shadowrunners" cheat, steal, hack, double-deal and connive. They pay when they absolutely, positively have to. Or when it's a friend. I don't want the free DocWagon subscription that was added to the $30 level! I don't mind using in-game money for DocWagon, but I do mind being forced to have a free subscription cheat simply because I'm a backer. I seriously hope this will be an optional feature for backers. Ooo! Can I make a Decker with a full-sized mechanical keyboard slung over his shoulder, too? So did the extra money for the improved music then go to getting these guys? Or would they have signed on anyway? Or did you have a less ideal music plan before you met your previous stretch goals that didn't involve them? Woot the shirts come in all sizes thank you!!! I would upgrade to the 3 shirt pack if i knew what *SIZE* shirts they were gonna be! I would also love a 2 shirt $150 pledge... I am just not interested in one of each... maybe mix and match? 2 of the gray and blue and one of the middle one... hummmm... maybe...? @Shane Tapp. Thank you for clarifying. Some people were talking about ordering just the physical card. I can't wait for this game. 50k in about 24hours. If this is the kind of support we are seeing in the closing stretches I think 1.8 mil is where this will top out. Upgraded to the $175 pledge, second upgrade now. REALLY wish I could swing that $250 for a signed edition...but alas gotta pay the bills. On a brighter note: So HYPED for Sam Powell and Marshall Parker getting in on this project! I just want to say, as a $30 backer, I really appreciate you guys throwing in the DocWagon. That was the one incentive I longed for most from the $60, which I just can't afford right now. Anyway, you've already got my pledge, but I'll be reminding my friends that the deadline fast approaches in case they haven't been as on top of things. 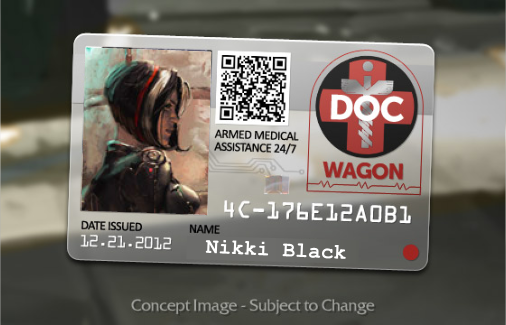 How feasible would it be to put your favorite's character portrait in the DocWagon card? I ask because most of the character art that players use belongs to someone else, and I wonder how much of a fair-use would it be to just put a portion (the face) in the card. I'd like an option to get just two shirts also, maybe in the tier range of $125 - $150. no edit feature failure... to clarify, if you read the tiers, the Platinum Doc Wagon card does not get rewarded until the $500 tier. No one below that tier will get it. Though, those after the $500 will. No Ed, the 175 isn't getting the Platinum, they will get a gold Doc Wagon card.